Branding Richmond's Mobile Farmer's Market — Campfire & Co.
Our friend and client, Dom Barret, the Executive Director at Shalom Farms, brought us an incredible pro bono opportunity this past Spring. A collaborative team from Shalom Farms and the RVA Food Collaborative were researching the viability of starting a mobile farmers market that would travel to communities that lacked access to healthy food. After months of research and planning, the collaborative team received a grant to help get the project started. With the momentum of startup funds in hand, they were able to purchase a refrigerated truck and design a system of flexible and mobile-friendly shelving with Barker Designs. Next up, they engaged with Campfire & Co. to help develop a brand and graphic identity for the market. We brainstormed with the team on their goals for the project and helped explore who their target audience groups are and how to best develop a brand that connected to them. Together, we confirmed the graphic concept and aesthetic should be welcoming, friendly, and immediately recognizable. Our intern, Josh Williams, worked closely with Lauren to illustrate a collection of vegetables that were playful yet realistic and appropriately represented what types of food would be for sale at the mobile market. 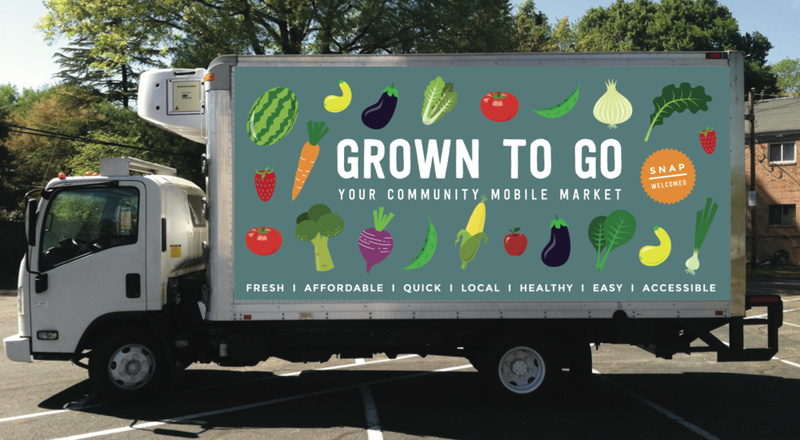 Lauren then applied the illustrations and new name, Grown to Go, to the colorful and eye-catching truck wrap! We are so excited to have had the opportunity to help out with this market. Combining our love for fresh, local veggies with the chance to give back to our community tastes so good! Thanks again to Dom, Shalom Farms, and the RVA Food Collaborative for bringing such an awesome project our way!